During a surgical procedure, it can be helpful to locate things to one-millimeter accuracy, but in a dockyard, locating huge intermodal containers to an accuracy of several meters is fine. What these situations have in common is that they increasingly employ Real Time Locating Systems RTLS, which electronically give the location of a remote object in 3D all the time. Although RTLS has been around for over 10 years, it really only took off in the last two years with, for example, over 100 US hospitals fitting the tags to staff and assets as certain versions of RTLS became affordable for this use. This year, with the advent of yet more versions, the market has widened even further. Indeed, the new Duracell advertisement even shows a mother finding her tagged child from a long way away in a park, using just a hand-held device. Analysts IDTechEx, Frost & Sullivan and Yankee Group have all forecasted that the RTLS business will pass one billion dollars well within the next 10 years, despite it being below $200 million today. Their precise figures differ because they did not collude in this, but clearly something is in the move. Partly, the growth is due to a widening of the market as the technologies improve in leaps and bounds. For example, there will be RTLS systems with ranges varying from a few centimeters to several kilometers and no one technology will win for all that. Already, system prices vary from a few hundred dollars to several million dollars. Firstly, there is demand pull across many industries. Tightened safety regulations and the huge cost of lawsuits is ensuring that all oil rigs and oil refineries must be able to track personnel in 3D at all times and there are similar pressures in mining and the chemical industry. Hospitals losing 15% of assets by value every year cannot afford to continue that way. A typical airport has lost 15% of its passenger baggage trolleys at any one time and RTLS with sensing is sorely needed in military and many other applications. In the early years, there were no standards for RTLS and single sourcing by small companies was a worry for users. Now there is a standard written around the WhereNet 2.4 GHz product and the wireless communication between the reader and the computer system is increasingly to the generally useful WiFi and ZigBee standards that have appeared. Indeed, one of the most significant recent developments is the extension of ZigBee to the Physical level “Phy” as a standard (i.e. the tag communication can form part of a generally useful standard). That standard encompasses RTLS readers that self calibrate so it does not matter if someone moves them. It enables tags that can talk to tags in mesh networks and other delights. For example, we estimate that a primary market for RTLS tags will be IEEE 802.15.4a compliant devices with the functionality akin to the new Decawave ScenSor product, bringing RTLS capabilities to ZigBee and WLAN APs should even increase this. The new DecaWave chip even permits greater than 11,000 tags per 20-meter radius and range of hundreds of meters line of sight and 100 meter obscured, says the company. Originally, IEEE802.15.4a devices were slated to be ZigBee Phy replacements, reducing power consumption, increasing data rates significantly whilst affording the added benefits of mobility and ranging. 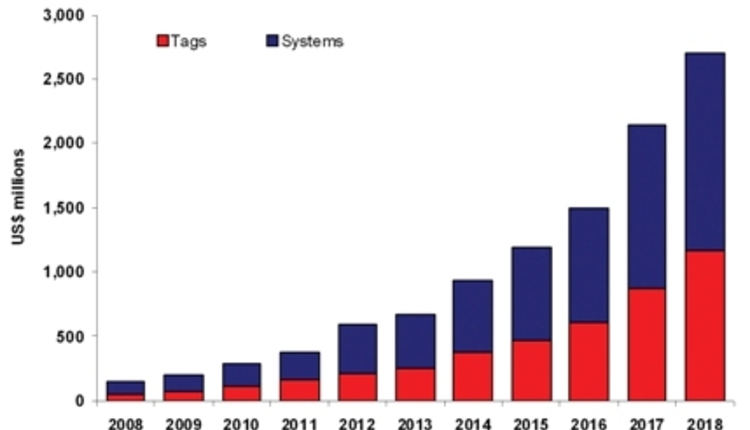 For now, our forecast is $52 million spent on RTLS tags in 2008 rising to $1.168 billion in 2018. We see a larger figure for the systems that go with these tags, of course. Traditional RTLS systems can cost millions of dollars, and there is still a market for ones that are exceptionally immune from interference and unable to cause significant interference while being very accurate, long range, very rarely out of action and so on. That provides major scope for the top of the market offerings from market leader WhereNet and for those offering the newer Ultra Wide band RTLS. The only formidable acquisition program in RTLS is that of Zebra Technologies recently bought WhereNet and Multispectral Solutions in the USA and proveo in Germany plus Navis which has a closely allied RFID operation. Systems offering a new mix of benefits such as easy installation, low maintenance and lower cost, rather than prioritizing accuracy, availability or range, are now serving an expanding market in manufacturing, health care and other applications. Some use existing wi-fi networks once they have been enhanced — AeroScout being the leader here and Ekahau an important player. Others put in their own infrastructure variously working at Low Frequency (LF), 433 MHz, Ultra High Frequency (UHF), 2.45GHz or Ultra Wide Band (UWB), which is a chosen broadband of microwave frequencies, but LF and UHF do not yet attract the bulk of orders. There are standards for most of these, and they have had in common the fact that the tag needs battery and a special silicon chip, the system only being saleable if the battery lasts for at least three years for the desired duty cycle. Battery life depends crucially on the type of battery and the type of chip. The rule book is now being changed with dramatic breakthroughs almost every month. In 2008, Mojix, RF Controls and Wirama have announced fully functioning RTLS that uses existing standard passive UHF labels currently selling in the hundreds of millions yearly and likely to be selling in the billions before long. These RTLS systems outperform many active (with battery) systems in range, figures of up to 600 feet being claimed. Mojix demonstrated 300 feet in an electronically noisy, crowded environment at the RFIDJournal Live event, where the delegates voted it Best in Show. Procter and Gamble and Kraft have verified that the Mojix system works in real world applications, and leading RFID system integrator Xterprise has announced a partnership with Mojix after noting over a dozen trials of the system over the last year. Kovio technology is capable of replacing the silicon chip in a basic UHF tag with thousands of printed nano-silicon transistors at one-tenth of the cost, when the company chooses that priority. IDTechEx believes that this could lead to even lower cost RTLS based on passive tags. Either way, widespread use of passive RFID RTLS in supply chains might result in the largest potential RTLS market of all being satisfied — that for always knowing all the time where all items in supply chains are located. Two impending conferences will give the latest news and analysis of the rapidly expanding RTLS technologies and applications. RFID Europe September 30-October 1 in Cambridge, United Kingdom (www.idtechex.com/RFIDEurope) and Active RFID, RTLS and Sensor Networks, November 5-6 in Dallas, Texas in the US (www.idtechex.com/active) will both have many RTLS proponents and users speaking and attending. The UK event will have Ekahau, Sonitor, Coronis. Essensium, Loc8tor, CST and other RTLS suppliers, many making new announcements and users and potential users the US Navy, Container Centralen, Lang O’Rourke, Marshall Aerospace and the UK National Health Service talking. Cambridge University will describe TINA, The Intelligent Airport — a self-organizing, wired/wireless converged machine. The US event will have RTLS suppliers Q-Track, Awarepoint, Sonitor, Loc8tor and others speaking and many end users. Indeed, it will be exclusively focused on Active RFID, RTLS and Sensor Networks. Both events will have visits to local centers of excellence in the subject — both users and suppliers. For more information on Real Time Locating Systems, please contact the author, Peter Harrop, atp.harrop@IDTechEx.com. To find out more about RFID Europe 2008, please contact the Event Manager, Corinne Jennings, at c.jennings@IDTechEx.com, and for Active RFID, RTLS & Sensor Networks USA 2008, please contact the Event Manager, Sarah Lee, at s.lee@IDTechEx.com.